To create The Pillars of Creation, three pictures were taken with three filters, each named after the wavelength of light they let through: Hα, OIII, and SII. If viewed with our eyes, both Hα and SII would be red, and OIII would be green. However, to better contrast the three wavelengths, the Hα image is re-coloured as green, and the OIII image is re-coloured as red. The final image is the product of combining the three re-coloured images. Recall that the gas close to the newly formed stars is being ionized by those stars. The pillars in the Pillars of Creation have denser gas, and so have not been ionized yet, while the gas around them has. 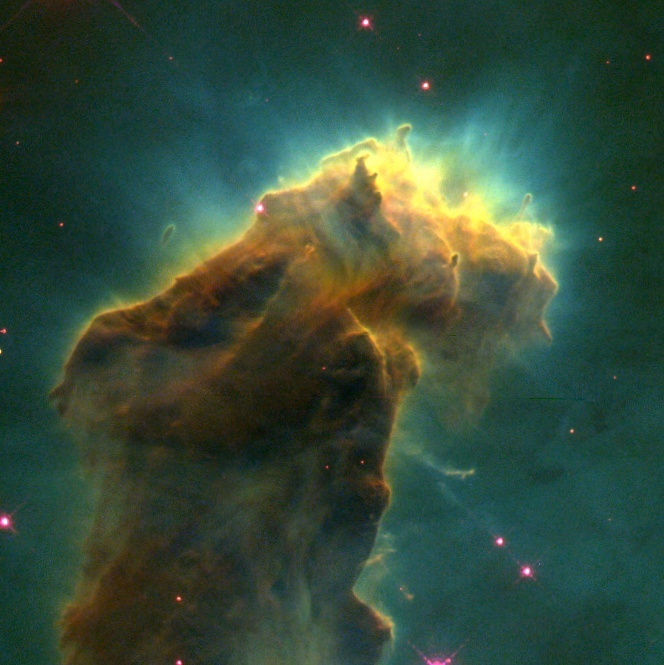 Thus, the edges of the pillars are part of the ionization front between the ionized and neutral of the nebula. Hα has a wavelength of 656 nanometers, and tells us about the density of ionized gas. The hot stars in the Eagle nebula emit light that can ionize hydrogen, the most common gas in the nebula. When an atom is ionized, it can recombine with an electron and return to normal; when it does so, one wavelength of light is can emit is Hα. In the ionized part of the nebula, hydrogen atoms are constantly recombining with electrons, releasing Hα, and then being ionized again by the star’s light. The more hydrogen atoms there are, the more Hα light we see. Thus, we can see that there is more hydrogen close to the edges of the pillars, because we see more Hα light there. OIII has a wavelength of 501 nanometers, and tells us about the stars in the Eagle nebula. OIII is a line that is emitted by oxygen atoms that have been ionized twice. It requires a lot of energy to ionize oxygen twice, so very energetic photons are needed. These photons have wavelengths so short that they are “bluer” than blue light we can see – they are ultraviolet. Just like how ionized hydrogen atoms recombining produces Hα light, ionized oxygen will produce OIII light. Hotter stars emit more blue and ultraviolet photons, and thus are better able to ionize oxygen. We can only see OIII light if the oxygen can be ionized in the first place, so the OIII light from the gas is stronger when there is a hotter star. We see that The Pillars of Creation image is blue-green outside the pillars: the presence of blue tells us that the stars in the nebula are hot. Finally, SII has a wavelength of 672 nm, and tells us about neutral gas. The ionization front occurs because the star can only produce enough light to ionize a certain amount of gas in the nebula. SII is a wavelength that is emitted by sulphur that has been ionized once. Sulphur is very easy to ionize, so easy that most of the sulphur has actually been ionized twice. Singly ionized sulphur is most common when hydrogen is no longer ionized, which occurs at the ionization front. Thus, the SII is strongest at the edges of the pillars. Look at the density gradient. How does it compare to the Hα emission? Increase the temperature of the nebula’s star. Why does the colour of the ionized region change from green to blue? How does just the OIII emission change? Increase the “ionization parameter” (this is like moving the star closer). Why does the ionization front advance? Why is the emission brighter at the front (hint: look at the density gradient again)? How does the SII emission move around?